Update 5:45pm PT: The video of the crash has been taken down, but you can read our description of the events as they unfolded below. 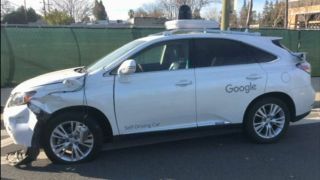 Video of the Google self-driving car's first at-fault accident has surfaced via the Associated Press. The video shows the view from inside the bus, including the driver eating a sandwich. At the 25-second mark, you can see the Google-fied Lexus RX450h graze the side of the bus. Thankfully it seems the accident happened so quickly with little effect to the bus and its passengers. Ultimately the worst of the damage of the crash was the bus driver dropping his sandwich and some body work on the Google car that won't just buff right out. The accident was the first time a Google self-driving car crashed into another vehicle. Previously, all accidents the result of human drivers running into the Google cars. At the time of the slow-speed collision, the Google car was driving 2 mph while the bus was moving at 15 mph. Google claimed its self-driving car artificial intelligence predicted the bus would slow down and yield, however, it failed to take right of way into consideration.